Incoming students and other foreigners at the University of Nova Gorica were invited to visit the traditional Students’ Wine Festival organised by the School of Viticulture and Enology of the University of Nova Gorica. 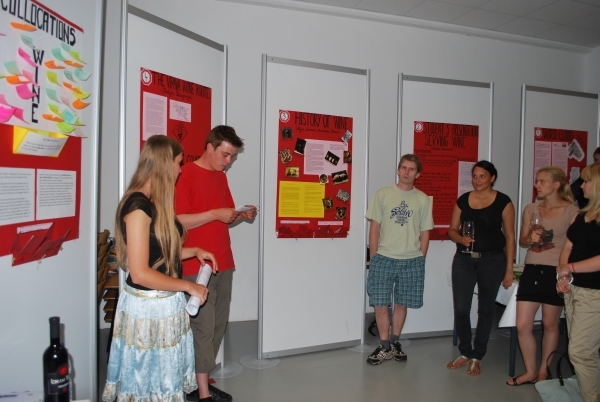 The event took place at the university’s centre in Ajdovščina on 27th May 2011. For the first time, the festival offered a foreign-language workshop with presentations of various viticultural and enological topics in English. The presentations were carried out by 1st year students of Viticulture and Enology and two incoming foreign students – Radim from the Czech Republic (currently an exchange student at our School of Engineering and Management) and Iuliia from the Ukraine (a PhD student in physics). Radim and Iuliia presented their home countries, the possibilities for Slovene students to study there as well as wine-growing in the Czech Republic and the Ukraine. – the presentation of a virtual winery – the website for the Castrum Estate in English, createdby students of Viticulture and Enology and the presentation of the original designs for wine bottles, business cards and grape seed oil/tea containers, created by Maja, a student of Engineering and Management, for the purpose of promoting the virtual Castrum Estate to foreign customers. The workshop was open to all the visitors of the festival, who could also enjoy tasting various desserts (made by students of Viticulture and Enology) prepared with wine and read the poetry in English written by students of different study programmes. To promote learning foreign languages in general, a multilingual “touch” was added to the workshop – the students (with the help of teachers) had translated recipes for dishes prepared with wine into various European languages and the visitors could take the nicely-decorated print-outs with recipes home. Foreign students and members of staff also participated in the workshop about the sensory evaluation of wines (we offered interpreting services for non-Slovene speakers) and learned how to taste wine, enjoyed wine tastings in the main festival room and the presentation of the new university’s brand of wines – Vilina, and tasted cherries and olive oil at the stalls in the hall. After the festival, we visited Cejkotova domačija, a local traditional winery in the lovely village of Goče. We learned all about the production of their special wines, tasted various wines and local traditional dished and visited their unique, over 400-year-old wine cellar. The whole excursion to the wine festival and the winery in Goče was a great experience. A special thanks goes to 1st year students of Viticulture and Enology who have been participating in the language project for the whole year and carried out the unforgettable workshop, and Maja, student of Engineering and Management, for incredible wine bottles designs . Thanks to the rest of students of Enginering and Management and Slovene studies who have also been involved in the project, all the visitors and other supporters. Tagged with EILC, Students' Wine Festival. we want congratulate students, which were take part in this amazing festival. with a great pleasure we were enjoying presentation of different kinds of wine and taking part in discussion with other visitors. The Hoče’s cousine was great. Really great festival (wine, food, presentations …). Next year I will definitely be there! It was a great festival! Positive energy, good wines … and those huge cherries! And I was very impresed by the village Hoče where we went for a dinner. I want to live in such village some day.